Luling has hosted the event since the 1950s. For that weekend alone the city swells from about 6,000 residents to thousands more. However, some say we shouldn’t spit the seeds out but eat them. Not straight from the fruit but sprouted, shelled, and dried for a nutrient-packed treasure. They are similar to sunflower seeds in flavor, but a little less nutty and thick. Of course most nuts and seeds are good for you. There is no need to go through all the trouble of sprouting, shelling and drying the seeds from your next watermelon. Just buy some pumpkin, sunflower, sesame or other seeds. Ounce for ounce they have about the same number of calories. And all seeds are a good source of protein and other nutrients such as vitamin B, potassium and magnesium. There is another reason why you may want to reach for another seed besides watermelon. 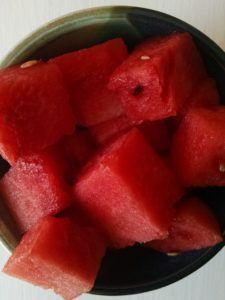 It’s hard to find watermelons that aren’t seedless. It’s getting to the point where seed-spitting contests will be a thing of the past. The good news is, even without the seeds watermelon is healthy. It is an excellent source of lycopene. Just 100g of fresh melon provides 4,532µg lycopene, compared to 2,573µg for tomatoes. Studies suggest that lycopene offers protection to the skin against harmful UV rays. So eat your watermelon and spit the seeds, or save them. No matter how you get it in your body, it’s good for you. No contest. 1. J Agric Food Chem. 2013 Aug 7;61(31):7522-8. doi: 10.1021/jf400964r. Epub 2013 Jul 29.